give you an instant eye lift." The Immaculate Brow Bar menu offers a meticulous brow shaping & sculpting experience. With a passion for perfect brows and makeup artistry, Maree has been creating beautifully shaped brows for over 20 years and ensures our Brow Artists are detailed in their brow shaping also. Every brow sculpting session is custom designed to compliment the facial contours of each individual. We only use pharo sugar wax or adam & eve resin wax to ensure the health & integrity of your delicate brow skin. Book a brow appointment online any time day or night at our Westfield Chermside Clinical Beauty Salon. Custom design compliments your facial contours. Our brow experts will consult with you prior to your service to ensure they achieve the desired result. We allow more time to acheive your perfect look. 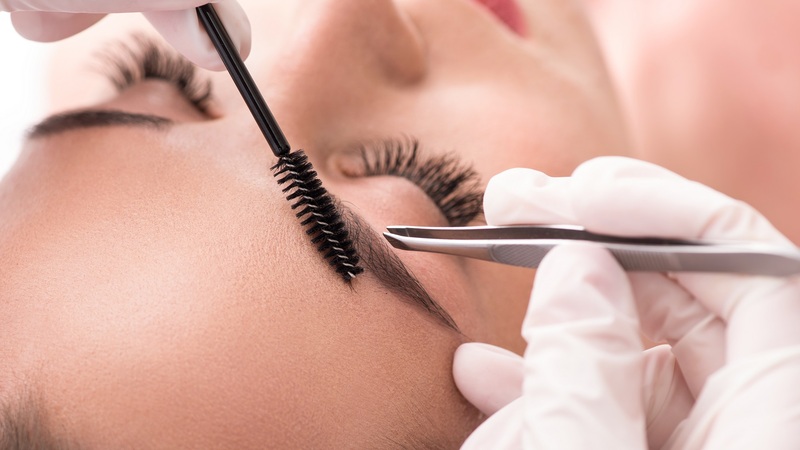 Each brow expert will perform the same techniques to ensure the same result every time. A tidy natural brow gives an immediate eye lift. Skin loving products for healthy brows. We only use skin friendly natural products on your fragile brow skin. Define your brows in minutes for our clients that book their brow tidy every 2 – 4 weeks. When it has been 5 + weeks since your last brow tidy & some shaping work is needed. Individually customized brow colour for naturally thick looking brows. Custom lash tinting for longer, thicker, more luxurious looking lashes. For Henna Lash Tinting add $5. Your brow specialist will precisely design, align, custom tint your lashes plus shape & tint your brows to suit your facial features. Natural and non toxic Henna is the best option for anyone with thinning and fair brows. Regular sessions of Henna Brow Sculpting has a conditioning effect that encourages hair regrowth. The stain will stay on the skin for up to 7 days and the tinted hairs remain tinted much longer than regular brow tinting. We include a brow shaping and sculpting with your Henna service so your brows are beautifully defined every time. How often do I need to book for my Brow Shape maintenance? Your express brow tidy will keep it’s shape for 2 – 6 weeks depending on your hair growth speed. We recommend booking ahead of time to secure an appointment with your favourite brow specialist. If I book ahead of time, will I receive a confirmation? Yes, we will send you a confirmation email or SMS 48 hours before your scheduled appointment time. How long will my Custom Brow Tint last for? Brow Tints last for 7 – 14 days & Henna Brow Stain lasts 2 – 4 weeks on the brow hair. The length your colour lasts is depending on the type of cleanser you use and how often you cleanse your brows. Hot Tip : Use a gentle, oil free eye makeup removal cleanser on the brows and avoid AHA and exfoliating cleansers to get the most out of your tint or henna stain. Ask you brow specialist which of our eye makeup removers are best to maintain the tint or henna on your brows. Is it beneficial to have a facial with my brow service? Yes, we highly recommend you have a facial with your brow service. We will perform a professional exfoliation treatment prior to the brow shaping and tinting treatment. By doing this your brow tint will penetrate deeper into the hair shaft and will last longer because you will not need to exfoliate your skin for at least 5 – 7 days. Will I be able to return to work after having my brow service? Yes, we are more than happy to apply an organic or clinical mineral makeup to conceal any residual pink in your skin. This will ensure your skin does not get irritated or clogged and is protected from the sun also.